Turn Up the BEET! There are lots of ways you can enjoy beets and one of the ways is to add into your smoothies! And if you don’t care for the taste of beets, no worries, you can totally mask it but soak in all the banger benefits! My doc told me to try and get in every day as my body is working hard creating life and supports the development of baby and me so I have been a bit extra obsessed but pregnant or not the benefits are motivating! Check out the list below. As I mentioned in my post, one noticeable thing I noticed after first week from drinking daily was the whites of my eyes got super white and skin felt more vibrant and hydrated! Below are a few recipes, but know you can add beets to any smoothie. If you don’t want there to be a change in flavor just add a little bit and make sure to peel to avoid a earthy dirt taste. And to make IT easy heres a prep tip you will love: peel and cut into cubes and freeze to have on hand and throw in raw! Makes for a pretty color too and unless you’re putting in loads you won’t notice any beet taste ;) One last tip, if you don’t have a high powered blender then steaming your beets will help maintain a smooth texture. With a high powered blender you shouldn’t need to tho. ⭐️ Contains Betacyanin which helps detoxify your liver and your blood and eliminate fatty acids and toxins from your body! ⭐️potassium-rich so helps balance electrolytes and regulate metabolism. ⭐️Contained Betaine- an anti-inflammatory agent aka less pain and swelling! ⭐️ Strong calcium source for strong bones and teeth. ⭐️A low-glycemic food therefor steady energy. ⭐️Rich in folic acid, beets can promote healthy growth and development of your bambino! * 1 small apple, cored. * 1 raw red beet, washed, peeled. Alooooooha! Sometimes you just want something fun and indulgent! 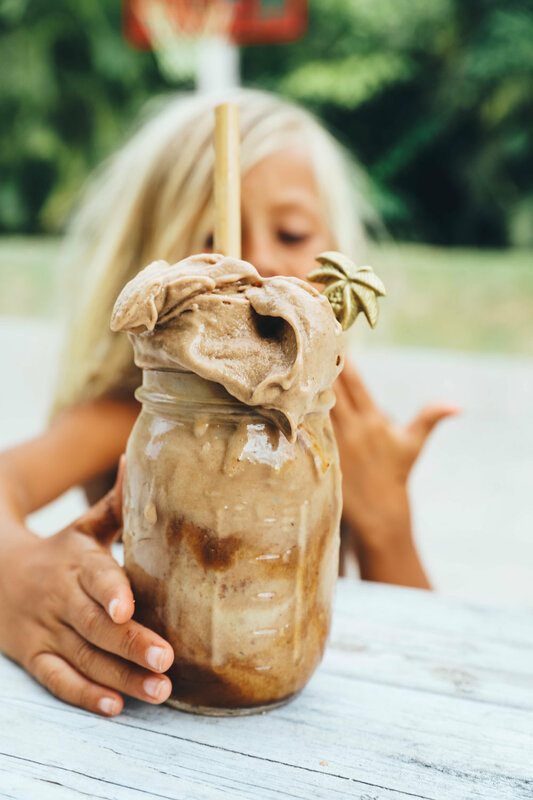 I love this shake as a cool down in the afternoons and sometimes after a workout and we top with a dairy free ice-cream (homemade or store bought sometimes) just when we are getting desserty with it ;) If you want to make for a party make mini shakes in mini little glasses! Its a fun way to serve a crowd! See if they can tell its vegan, dairy free, non gmo, processed free and the list of unnecessaries goes on! If you want to make and share! Tag me on Instagram @earthyandy. Also curious how your #21EarthyDays is going! We are on day 10 now! In this smoothie feel free to omit the vegan protein powder and add a little more cacao to taste. The coconut sugar and dates are for that caramel taste more than anything! Coconut Sugar is a better choice of sugar than brown or white or even natural options like agave and maple syrup because it does not spike blood sugar levels as fast! That is why its preferred in our home. ALSO, if you don't like bananas, just had another 6 nut milk cubes! Lastly, its also enjoyable adding ice and more liquid! (This is a better option for those that are not using a high powered blender. Carnival Cruise Line asked us to share a recipe that we can make at home that is inspired by the Islands - and what better recipe to share than an Açaí Bowl! Açaí bowls originate from Brazil but have been made popular in the islands for many years now. What we love about açaí bowls is it is a quick, refreshing and healthy snack and can be found just about anywhere in the islands. It is common to use apple juice or soy milk in the recipe, but in our house, we do it a little different. Hope you enjoy the video, and you can find the recipe below. Serve immediately in bowl and add your favorite toppings. Here we used fresh bananas, blueberries, passion fruit, granola, natural coconut flakes and fresh sliced mango! PS For those asking about my blender, I have used a Vitamix for over 10 years. I had the 5200 Standard Series. Any model I have had is awesome and will give you that ice-cream texture you want! I gave my first one away to a friend to help her stick to her health change. It was 8 years old and still worked perfectly! I now have a couple because Vitamix has sent me a few to try in the past two years. I use them for events and at home Im pretty sure the neighbor kids and our friends look at me and see a big smoothie bowl so I use them a lot! haha. Currently I use the Professional Series 750 in Champagne color. :) I also have the Ascent A3500 which is their newest model and just a beast!! If you want to get one the code 06-031 gives your free shipping which can be sometimes $60. (makes 2) - try to use organic ingredients. 8 frozen Almond Milk Ice Cubes (I always have these made in my freezer). Simply freeze your favorite almond milk into ice cubes and store in an airtight container. The coconut sugar and the vanilla help give a warm toffee caramel undertone while the peanut butter makes it feel and taste rich! You can add cocoa powder as well for an added chocolatey flavor or leave it out! Its two different shakes just by doing that! If you make it, let me know by tagging @earthyandy via insta story or on the picture! I always love love love seeing what all ya are up to! I personally love starting my day with a tall glass of water mixed with fresh lemon juice and apple cider vinegar with a spoon full of molasses (see why below), followed by a tall hydrating green smoothie. Feel free to double this recipe if you are hungry throughout the morning. I usually sip on this throughout the morning. Here are two recipes that are simple to make, taste good and take no time at all! 1/4 cup parsley or mint (optional) - anti-inflammatory - will alter taste slightly. Blend until smooth - Enjoy! 3 frozen ripebanana (or mango, or blueberries- it will alter taste but be good). Add filtered water to expand if desired. Morning Start- A few tips to get the day going in the right dirction! For a good start on the day (you likely will detest this at the beginning haha). Try drinking warm or room temperature water with 1/2 lemon squeezed, 1 teaspoon apple cider vinegar and 1 tablespoonmolasses. WHY? Read below the many reason but right off the bat... It curbs your appetite like no other and sugary food (Cereals, donuts, whatever), you wont be able to even stomach it! I actually like it this concoction now! My husband has been doing this now for a good 8 months and finds without it he craves sugar etc. It sets the tone for the day. 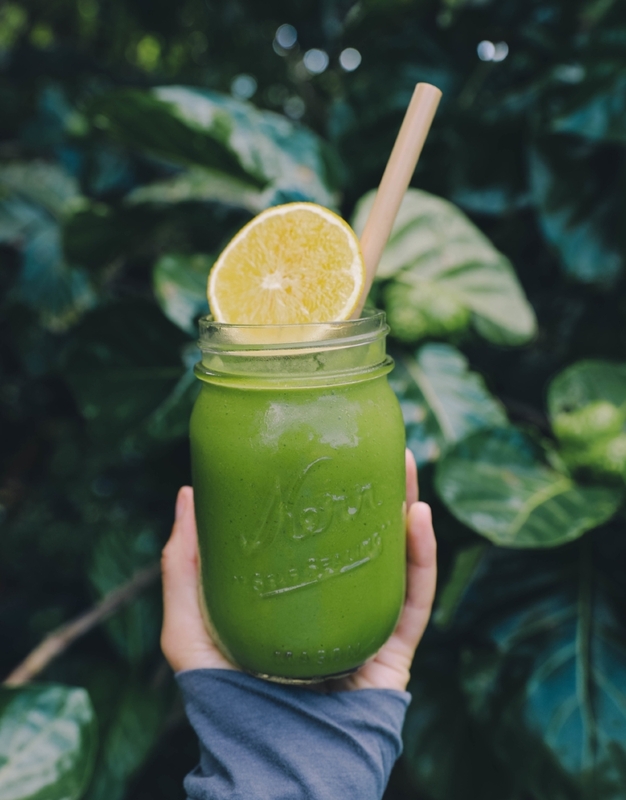 Starting your day like this is going to give your insides a morning rinse, your metabolism a kick start, hydrate your cells and curb cravings which naturally prepare you to make food choices that will also support a healthy gut. Listed below is a little more info on what to try! Hope this helps! Pair this with some exercise and you are going to be golden in a matter of no time. I can't promise anything because I am not a professional, but what I do know is nature is going to support your health more than processed. Its back to the basics with nature! Apple cider vinegar and vinegar in general are composed of acetic acid which aids in digestion through its anti-fungal, antibacterial and alkalizing properties. Apple cider vinegar can decrease inflammation throughout the body and specifically the digestive tract. I take 1-2 tbsp. diluted in water every morning or before every meal. Apple cider vinegar has been a remedy to digestive issues for over a thousand years and can even help with reducing candida! Black-strap molasses is packed with so many nutrients like vitamin B6, magnesium, iron, potassium, calcium and so much more! Taking a tablespoon of molasses every morning helps to jump start your digestive track and gives your body the minerals and nutrients it needs for healthy hair skin and nails. Interesting fact…black-strap molasses is nutrient dense in magnesium which helps your muscles relax and draws water into the stool which promotes gut health! The best part is a jar of proper molasses is just a couple of dollars! Fiber rich whole foods are so important to a healthy gut because of the effect that fiber has on the digestive system which includes a healthy gut. Fibre rich whole foods can help control blood sugar, promote heart health and offer relief from IBS. I love making green smoothies or having a large salad with kale or spinach. Fiber rich foods help with normal bowel movement and bowel health together. Did you know that staying “regular” helps with energy levels and mood? It sounds too simple to be a solution to a healthy gut but a healthy gut needs good old fashioned H20 and foods that are dense with it to help keep that digestive tract stay clean and clear. I like to drink a glass of water with lemon right when I wake up and then before every meal the best I can. I also eat a lot of cucumbers and melons which are 96% water! Lastly exercise! Movement where you can when you can really pays off! I love to stay active and get in some type of physical exertion everyday whether it’s working out with my hubby, going for a bike ride with the kids, going for a run, swim, doing yoga or going for a surf! Exercise, specifically high intensity interval training (HIIT) has been found beneficial in promoting a healthy gut. (I didn't know this until recently). Exercise helps improve the balance of bacteria in the gut, while improving your circulation, weight, skin, mood and the list goes on…. In case you need some extra motivation! I hope this helps a bit! I know there is a lot of advise out there! This is what worked for me and if its any help to you that's awesome!! Aloha! I am really excited to share and discuss gut health together and grateful WelleCo was keen on pairing up to promote this important topic and whip up some yummy alkalizing recipes together! Lets face it, a healthy gut is tricky these days with all the processed sugar and fat laden products out there. There is just so much information out there that it gets confusing for us to know what to do so my biggest piece of advice to live by before we get into specifics .…eat a variety of whole foods and not too much! Keep it simple. Stick to the basics. Pick Plant over processed and your body will utilize the nutrients its needs and find a proper ph balance and this is where you will accomplish a healthy gut aka a happy life! Just do the best ya can. And don't fret, this doesn’t mean never indulge but my advice is to make the majority of your diet and lifestyle clean and sustaining! Give that love your body needs! (And just so you know all recipes on my site are meant to be gut friendly (even nicecreams in moderation)). For many people I know its hard to always eat fresh and look for a supplement to accompany their diet so this month I partnered with The Super Elixir by WelleCo to share recipes and tips that can improve gut health using their Alkalizing Greens, which is an all natural multi-vitamin supplement made with premium cold pressed bio-live ingredients! It is a definite favorite of mine. On Instagram this past week, many of you voiced you had stomach issues you have and want to improve. I also loved reading how so many have found freedom from IBS, leaky gut syndrome, weight gain, fatigue from following a plant based diet. Some of you said you went vegan hoping for these benefits with no success. I have personally found that it takes more than going vegan to heal. As you work on becoming an expert on you here is what has worked for me and may work for you! second, nuts, seeds, too much acidic foods (grains, processed foods) can cause stomach bloat so maybe avoid for a while and introduce gradually later. For a good start on the day (you likely will detest this at the beginning haha). Try drinking warm or room temperature water with lemon, apple cider vinegar and molasses. Read below to understand this madness… If you do this though, you will not crave anything sugary after. It curbs your appetite like no other and sugary food (Cereals, donuts, whatever), you wont be able to even stomach it! I personally drink lemon water first, take a spoon of vinegar with a little water, and then a spoon of molasses straight. I actually like it now! My husband has been doing this now for a good 8 months and finds without it he craves sugar etc. He is sold on it too. 1 teaspoon superelixir alkalizing greens. Blend until smooth and top with your favorite toppings. I enjoy mango blueberries kiwi granola and coconut shreds! P.S. You can make this into a smoothie and if you don't have the Superelixir powder yet you can still use this recipe! Hey guys! Its been a million degrees outside these days so we have been craving cool downs more than ever! I bought a big bag of frozen cherries from Costco and thought of making a black forest shake but instead made a Vanilla Bing! We'll have to do the chocolate version another day! This was was super good and the perfect refreshing shake full of nothing but the good for ya stuff! One thing we always have in our freezer now is frozen cubes of coconut milk and almond milk for thick shakes and nice creams. Its super simple and a great way to get the texture we all love without using ice creams. Blend until thick and creamy! If you dont have a good blender add extra almond milk to help it spin! In the picture I have the recipe without the cherries on the bottom (which is super good) and made it with the cherries for the top! If ya make it let me know via instagram by tagging @earthyandy! Enjoy and hope you're all good! Hi!! I hope you all had a good weekend! We had a sleepover at our place with some of Tama and Ira's cousins and in the morning they wanted to make breakfast! I was stoked to hear because my friends at Vitamix are celebrating how to get kids involved in the kitchen and thought it would be fun join and share what these crazy coconuts got up to! *P.S. For those asking about blenders, the only one I have ever used and adored is Vitamix. We use our every day from everything to soups, sauces, salsa and of course smoothies and ice creams! Vitamix's gives that desired ice-cream texture to our smoothies and nice creams . If you're interested in purchasing one right now is a great time because they are doing a big Mothers Day promotion all week and giving up to $90 off! And free shipping with this code '06-031' when you're checking out! Heres a link to their page if you're keen, click here. So! One of the ways we get kids excited about food is by giving them a range of freedom in the kitchen and treat creating a dish like a science project! Sometimes I know what they are about to put in their "recipe" is going to just ruin it completely ( like Ketchup in a smoothie) but instead of telling them don't do it, I just say, 'wowa, thats an idea, lets see what happens!' Sometimes its a waste of food, but its a good learning experience and I want them to feel free and learn for themselves what flavors go together and don't and just have fun! I want my kids to feel the kitchen is a gathering place and place of good times! The granola I wish I could share a recipe for because it was dynamite but they were just tossing amounts on the cutting board and I really don't know the measurements but the ingredients that went in were steal cut oats, organic peanut butter, coconut sugar, cacoa and crushed cashews. They melted everything together and then added the cashews and oats. We just kept adding more oats until it was a granola like texture and let it cool in the fridge. Its soo good! Here is the recipe for the KOKO BOWL which the kids say taste like an Oreo Shake! Blend all ingredients together and top with banana, coconut chips and granola! Feel free to add peanut butter to add another level of flavor! Enjoy!! If you make lets me know by tagging me on @earthyandy! I love seeing your creations! If you have any questions find me there! Im faster at answering there than on here! Hope you all are good!